George Foreman grills are so easy to use, grilling a whole host of food and can help you to cook up a healthier, tastier meal or snack in no time. 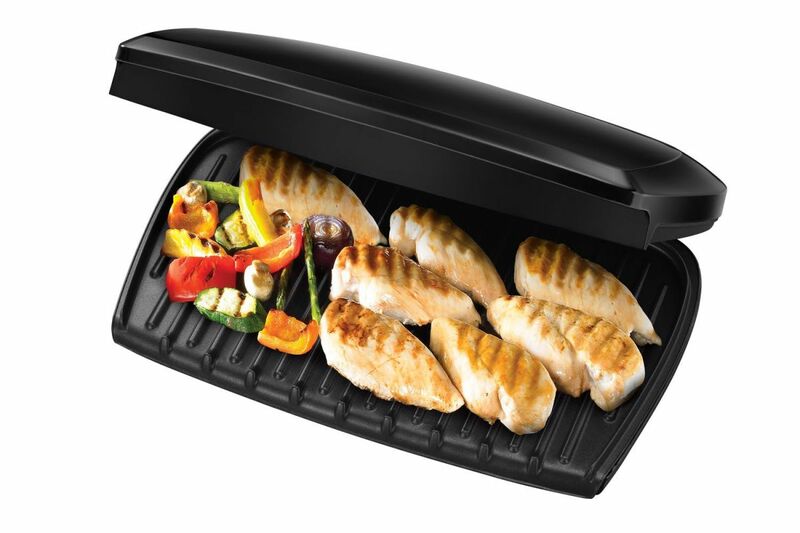 The George Foreman 10 Portion Entertaining grill is ideal for larger families, entertaining your friends or even hosting an indoor BBQ if the weather is not co-operating!! This George Foreman Entertaining 10 Portion Grill has a cleverly designed floating hinge which accommodates extra thick cuts of meats and burgers. With a floating hinge the grill top can move more freely, ideal for toasting sandwiches and paninis. This plate can cook up to 10 portions making it the perfect size to cook your favourite dishes for the family and friends. Fat reduction is at the primary core of the George Foreman brand and independent tests have shown that the George Foreman Grill removes up to 42% of fat from food. The patented angled grill channels fat and grease away from foods, and contact grilling from both sides applies gentle pressure onto food encouraging additional fat to be removed.